A plica is connective tissue in the knee that exists in all fetuses but normally recedes to small bands of tissue in adults. In most athletes, they are not involved in any significant function, but they can become inflamed and serve as a source of pain. Typically athletic individuals with plica syndrome complain of pain on the medial side of the knee, just inside of the patella. If the tissue is inflamed and swollen, he or she might note a snapping sensation as this plica rubs across the bony prominence on the inside of the knee with knee motion. 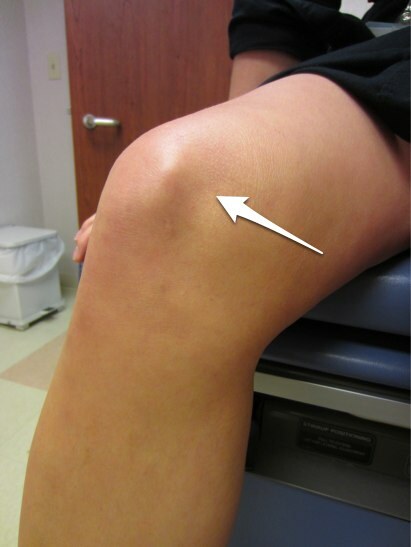 Pain from a plica is most often felt on the medial side of the knee above the joint line (white arrow). The diagnosis of plica syndrome is often made by exclusion after a sports medicine physician rules out more serious problems such as meniscal tears. History and physical examination usually suggest a fairly localized pain on the medial side of the knee, but x-rays are usually normal. An MRI might be ordered to rule out a meniscal tear or other pathology. If the plica is swollen or enlarged, an MRI might identify it as the source of pain. MRI can be tricky, though, as one might exist in someone, but it might not be the source of the pain. Treatment of a painful plica is usually nonoperative. Anti-inflammatory medications and ice can help. The athlete can play sports and participate in desired exercise activities if he or she can tolerate the symptoms. Occasionally the sports medicine physician might try a cortisone injection into the plica to try to calm down the inflammation or send the patient to physical therapy for exercises and possibly ultrasound or other modalities. If surgery is a treatment option, here is information on recovery. Occasionally surgical treatment is needed if no other treatments have helped. The surgeon looks into the knee arthroscopically, and if he sees large, inflamed plica, he uses a shaver to remove it. Treatment after surgery consists of efforts to decrease swelling, improve range of motion and strength, and exercises and/or physical therapy to improve function before getting back to sports.